This windows door sensor can detect the opening and closing of door and windows by sensing the near and separation of the sensor subject and magnet. It will send a notification to your phone via the APP when there is a movement. 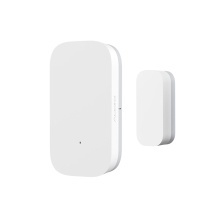 Works with orger smartdevices such as gate-way remote control and air cleaner, this sensor is able to help you create a cozy and convenient life. Detect the opening and closing of door and windows, send notifications via APP. Can be matched with other smart-devices such as gateway and air cleaner, make life convenient. Consists of a sensor subject and a magnet, ensure the detection much more accurate. Small size and compact, easy to install and set, no other tools needed. Sleek smooth waterproof finish with high durability and no fade. Suitable for various kind of occasion such home, office, store, warehouse, etc.